Savor the flavor and texture you've been missing. Come to Comfrey Farm®, where the finest Certified Duroc® heritage pork is crafted in small batches to be nutrient-rich, sustainable, and the most succulent you’ve ever tasted. See why our Certified Duroc is starting to win the hearts and appetites of meat connoisseurs! You deserve better pork. What went wrong? How did pork become dry, boring, tasteless…and white? Through an emphasis on production efficiencies and lean cuts. Isn’t it time to taste honest-to-goodness, full-flavored pork? Now you can indulge your craving for the rich, aromatic, sensual pleasure of oven roasted and artfully grilled meat. Trust Comfrey Farm® Prime Pork to bring you robust tender meat, brimming with juices. We produce in small batches for exquisite flavor, integrity, and the ultimate in traceability and accountability. The safe and correct pork cooking temperature of 145º F is the final step in plating a perfectly juicy, tender cut of meat. For Glen, pork is personal. Raised on a family farm in Comfrey, Minnesota, Glen Taylor savored the memorable taste, aroma and good-for-you nature of farm-bred pork. 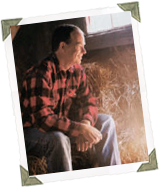 Today, as owner of legions of successful American companies, Glen puts his resources into building businesses that positively impact people’s lives…creating jobs in rural America…and bringing back robust flavor and accountability to discerning consumers and chefs who expect the best. We will passionately strive to serve our customers, partners and fellow associates with the attention and respect they deserve. Comfrey FarmR Prime Pork will bring you unbeatable customer service and the juiciest, most flavorful, tender pork you’ve ever tasted. Extensive marbling means tender meat that is satisfying and juicy. Our meat’s ruby pink color, which comes from optimal pH levels, indicates fabulous texture and taste. 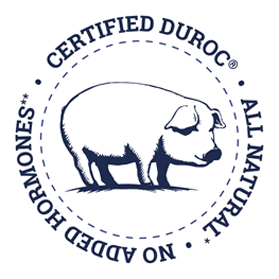 Concentrating on Certified Duroc® pork ensures an incredibly consistent, delectable eating experience. Comfrey Farm® Prime Pork is one of only a few pork producers able to offer a USDA all-natural, Certified Duroc® program. Comfrey Farm delights in bringing Duroc pork to your fork. Share the news with fellow connoisseurs. It takes patience and great care to raise the best stock. Our family farmers and breeders are known for their integrity. They share our passion and commitment to the most rigorous standards for raising animals. This ensures unparalleled transparency, traceability, product consistency, and accountability. We’re proud to have the Taylors, Strobels, Bullermans, and Truebenbachs among the select group of our trusted family farmers. These farmers live within a 150-mile radius of our facility, which shortens the transport time and reduces stress for the animals, resulting in better meat. Our barn was built with advice from Temple Grandin, respected livestock consultant and expert on animal behavior. There is ample space and special flooring for ease of movement. Built-in resting periods and fresh, open air maintain animal comfort. Raising animals with respect and dignity is not just the right thing to do; it produces better tasting meat. Advanced robotics. Skilled butchers. Rigorous quality control. That’s how we deliver consistent flavor and safety from farm to table. 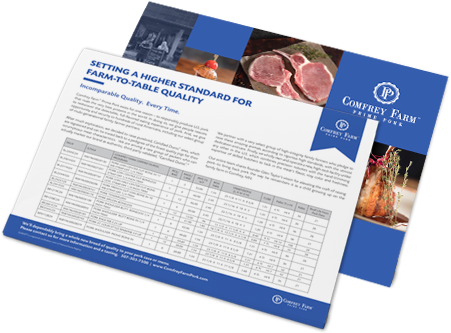 Comfrey Farm® Prime Pork owns and operates a new high-tech facility – the best you’ll find anywhere in the U.S. Every part, every protocol was created to produce the best tasting pork ever, in the safest way possible. Our processing combines high tech automation with precise temperature control and sanitization measures. Digital controls allow for custom, precision cutting and less human error, as well as optimal safety for our employees and your food. Join us and become part of the story! Interested in partnering with us to sell the finest pork available? Want to learn more about our #ComfreyDurocStar pork? Interested in joining the Comfrey Farm® family?